Operating a masternode requires a 1000 3DC locked transaction representing a collateral, this transaction's ID and various keys will then be inserted in a configuration file to prove the existence of the collateral, once the file edited, the master node can be started using the official 3DCoin Core wallet. The following guide will explain the setup step by step. Make a copy of the Collateral's Adress. Same Steps for each new Masternode. Once the transaction is complete, inspect it in the blockchain explorer by searching for the address. 15 confirmations are necessary for you to start the masternode, but you can already proceed to the next step. Take note of the masternode's private key and the collaterals locked Transaction ID, since both are needed in the next step. 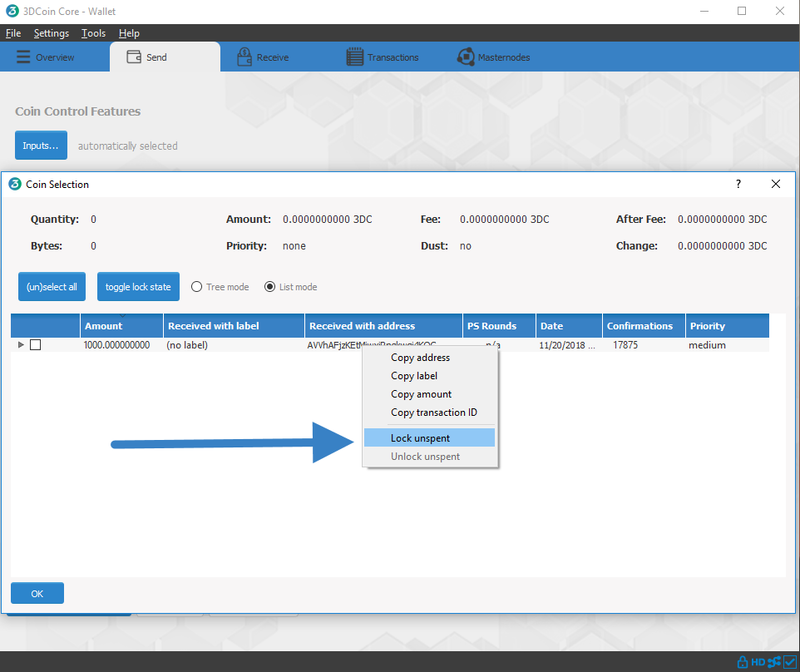 3DCoin Core is the software behind both the 3DCoin Core GUI wallet and 3DCoin masternodes. If not displaying a GUI, it runs as a daemon on your VPS (3dcoind), controlled by a simple command interface (3dcoin-cli). Open PuTTY or a console again and connect to it using the username and password you just created for your new root user. to install 3DCoin Core, follow this steps. To automatically download and install the components of your 3DCoin masternode. Get back to your 3dcoin desktop wallet. To start your masternode, Click on "start missing"